The mid decades of the twentieth century were the heyday of Imperial California. The Golden State’s population swelled, its youth revolutionized the nation’s commerce and culture, its entertainment industry colonized the globe, and its aerospace industry ruled the future. Like all ascendant empires, Imperial California required an architecture to manifest its glory. No architect exceeded Welton Becket’s influence in this period of expansion. The young man from Seattle who became a confidant of Walt Disney and architect for Buffy Chandler had arrived in L.A. in the 1930s at a time when he could substantially reshape the city. The highlights of his career are impressive: Hollywood’s Capitol Records building gave Hollywood an instant postwar icon; Parker Center embodied all that was progressive and modern in city governance; Bullocks Pasadena showed that the new suburbs could be elegant; Los Angeles International (with Pereira, Luckman and Paul R. Williams) was a gateway to tomorrow; Fashion Island, the UCLA Medical Center, Pauley Pavilion, the Cinerama Dome, the Beverly Hilton, the plan for Century City, and crowning them all the Music Center — a latter-day Acropolis for the arts. Each is a Becket design. Put them together and you have a comprehensive catalog of the era’s confidence, innovation and progress. Consider the number of landmarks in this list. Becket buildings molded our image of L.A. in this era. Even vanished Becket buildings have left an indelible after-image: the Pan Pacific Auditorium remains a part of the mental landscape of L.A. long after the actual building burned and crumbled. So it should be surprising that Becket’s name is not widely recognized or revered today. Mid-century Modern design is undergoing a welcome renaissance, but the architects we identify with it are mostly known for their residential design: Neutra, Eames, Lautner, Koenig, Ellwood – unlike Becket, whose work was largely civic, commercial and corporate. Why aren’t Becket’s monuments similarly celebrated? One possible reason: many Angelenos still harbor ambivalence about this era which confirmed their city as a unique world capital. The era was the high water mark of suburbanization, constructing a city from a web of freeways, housing tracts, office buildings and shopping malls – everything that has become fashionable to dismiss as “sprawl.” The polycentric city of today, woven together from hubs in Santa Monica, Westwood, Century City, Burbank, downtown, Costa Mesa and elsewhere, was cemented during this era, with the considerable architectural aid of Becket. Despite the fact that suburbanization is Los Angeles’ natural inheritance, we prefer to live it, not think about it. Another reason: Becket’s very success. His buildings captured the personality of mid-century LA so well that they served as templates for many other buildings. His pioneering planning ideas were so influential that they established a norm. Becket buildings have blended with the pattern and texture of our postwar suburban metropolis so seamlessly that we take them utterly for granted. The suburban shopping mall set in its par terre of parking was pioneered by Bullock’s Pasadena; the suburban civic design of Becket, Gruen, Pereira, A. C. Martin’s prototype malls adapted modern space and uses with an abstracted neo-formalism of tapering columns and curving facades. A fresh look at Welton Becket’s career and influence would not only help us to understand his era, but ours. We would not be the city we are today if this era had not set us on a course with its innovations, its reach, its scale. What was the Becket style? Modern, clean, well organized, on budget. At their best they could be as elegantly composed as a Neutra building (Parker Center) or as original as a Lautner building (the Capitol Records cylinder.) With a prolific output and an enormous staff – in the 1960s Welton Becket and Associates was the largest architecture firm in the nation — not all the office’s work was as fresh or innovative as these. The daunting challenge to large scale corporate architecture in the second half of the twentieth century was to supply industry and government with the shelter and symbols they needed, while avoiding blandness and oppressive size. Welton Becket and Associates did not always escape those pitfalls. But measured by the best of their buildings, Becket’s record bears comparison to any other large firm in the nation. Becket had arrived in Los Angeles from his native Seattle at the right time. The multi-centered metropolis, the commercial suburban city that he would help articulate, was already taking root in the early 1930s. Los Angeles fancied itself, even then, as the City of Tomorrow. Becket and partner Walter Wurdeman’s winning competition entry for the 1935 Pan Pacific Auditorium captured the city’s optimism and progressivism. The masterful Streamline Moderne composition was instantly popular. Its fluid pylons seemed a portal to the future. It was Becket’s first iconic design. With the end of World War II, the entire architectural profession realized that the face of the American city was about to change dramatically. No one yet knew exactly how. But Wurdeman and Becket (renamed Welton Becket and Associates after Wurdeman died unexpectedly in 1949) set out to rethink almost every genre of urban architecture: shopping centers, work places, recreation venues, hospitals, housing, education, culture. On the way they reorganized the traditional architecture office to handle the increasingly large and complex projects that governments and developers demanded. Their 1947 Bullocks Pasadena was one of the first department stores in the nation to step out of the traditional downtown and into suburbia. But the old, formal downtown department stores, modeled on palazzos, had to be reconfigured for the larger, open sites in lowrise suburbia, had to be restyled for its casual lifestyles, had to be reshaped to deal with the automobile. New forms followed new functions. Mastering the Late Moderne style as they had the Pan Pacific’s Streamline Moderne, Wurdeman and Becket oriented Bullocks’ main entries to the auto parking terraces (elegantly landscaped by Ruth Shellhorn) in an innovative and fully realized design. 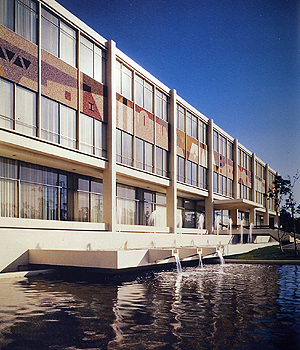 Becket followed Bullock’s Pasadena with a succession of shopping centers evolving the type: Stonestown in San Francisco, Bullocks Westwood and Northridge, Seibu (now the Peterson Automotive Museum), malls such as Del Amo and Fashion Island, and literally dozens of others across the continent. The modern workplace? The Prudential Center on Wilshire, the General Petroleum building downtown, Capitol Records in Hollywood, Parker Center in the civic center explored different solutions to the need for flexibility in dynamic industries. They lead to Welton Becket office towers from Houston to Bartlesville to Oakland, for Ford, Kaiser, Phillips Petroleum and Equitable. Americans began vacationing in droves in the 1950s, and Welton Becket (with Pereira, Luckman and Williams) designed the LAX jetport. Becket designed modern tourist towns at Canyon Village at Yellowstone for the National Park Service, Hawaiian Village in Honolulu for Henry J. Kaiser, and hotels at Walt Disney World in Orlando and Las Vegas. Though he and Wurdeman began their partnership designing Tudor mansions for movie stars in the 1930s, they also helped to design the classic Ranch-style tract houses of Panorama City (idealized in their 1943 House of Tomorrow on Wilshire Blvd.) in 1950 for developers Fritz Burns and Henry Kaiser. As master planner for UCLA, Welton Becket Associates designed much of the extensive Medical Center, dormitories, the student center, many classroom buildings and Pauley Pavilion. In the ultimate assertion of the multicentric city, Becket planned Century City, converting the old movie factory into a new type of downtown. To fulfil the cultural and recreational needs of the new city, he built the Memorial Sports Arena (where JFK was nominated for president in 1960), the Cinerama Dome, and finally the Music Center. Magnificently modern, the Dorothy Chandler Pavilion’s walls swell outward and its columns taper tautly as if responding to unseen forces within. Its self-confident, inventive ornament, and its cascading neo-baroque staircases express the assured opulence of American mid-century might. The Music Center is a shopping center of culture. As a public space in the heart of downtown, the big boxes of the Chandler and Ahmanson linked by arcades, plazas and fountains mirror the shopping malls of the suburban metropolis. The similarity (seen also in Pereira’s LA County Museum of Art) is hardly coincidental. Welton Becket was, after all, an architect who knew how to design successful shopping centers – the large public spaces and de facto town plazas of Southern Californians. Like the Agora in ancient Athens, Les Halles in Paris, Fifth Avenue in New York, the buildings of the public marketplace have always been as important to great cities as cathedrals and palaces. Los Angeles architects adapted that urban constant to the twentieth century city of housing tracts, regional malls and freeways. Becket played a significant role shaping the region and the era behind the scenes too. None proved more consequential than when he advised his friend and Holmby Hills neighbor Walt Disney to abandon an architect’s design for his new amusement park in Anaheim. Design it yourself with your movie studio staff, architect Becket urged the movie maker. Given the impact of Disneyland in planning, suburbanization and culture, no advice more far-reaching was ever given in twentieth century architecture. This brief list doesn’t give full credit to Becket’s entire work. 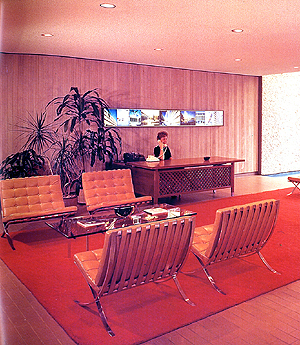 Welton Becket and Associates spanned the global corporate culture (Hiltons in Havana, Cairo and Manila, office buildings and shopping centers from Newport Beach to New Jersey) before Becket died in 1969. Yet for all the national and international scope of his work, Becket remained a Los Angeles architect. From the beginning of his career, he was designing the City of Tomorrow. He mastered the fundamental forces that shaped the twentieth century city: technology, commerce and popular culture. The high art Modernists who made it into the history books addressed the first issue successfully, but rarely the second and third. Without aspirations to high art, Becket responded to these urban forces with pragmatism and innovation. City leaders were in philosophical agreement with him; note that the Music Center patrons did not need to and did not choose to reach to New York or Europe to tap an architect of sufficient ability to conjure up a suitable landmark. Today Los Angeles can begin to rediscover this complex, sometimes vexing, but undeniable part of the history that made us who we are. We can face Becket’s faith in Los Angeles as we begin to see the interplay emerging between the 35-year-old Music Center and its new neighbor: Frank Gehry’s Disney Hall doesn’t rebuke or ignore the Music Center; its curves respond to and enhance it, creating a stronger unified cultural center atop Bunker Hill. This is a superb example of how new architecture can acknowledge our past (and our identity) as we move along new paths. Growing from a two-man office into the largest in the world, prepared to handle any project of any size and any complexity, Becket’s career rode the trajectory of twentieth century Los Angeles. Today, thirty five years after his death, Welton Becket’s legacy is still inescapable as one cruises the region. His contributions have not faded. They have simply become so integral to the fabric of the city that we no longer notice them. But we should. We cannot afford to take the buildings of Imperial California for granted. We cannot afford to deface a seminal landmark of suburbia like Bullocks Pasadena. In these buildings lie the key to the balances, the forces, the character, the urban rules – whether we approve of them or not – of our suburban metropolis. Architects must understand the tradition and legacy that lies behind the organic life of the city. In understanding them lies the workable solutions to the urban challenges of today. Alan Hess is the author of Palm Springs Weekend and the architecture critic for the San Jose MercuryNews. His landmark books include Googie and Viva Las Vegas. He divides his time between Detroit and the San Francisco Bay Area.